One of my biggest safety concerns while backpacking and hiking here in Hawaii is severe sunburn and skin damage. Many of the trails lead to exposed ridgelines with no escape from the hot island sun. Usually by the end of the day, my skin ends up completely fried. It seems that the sunscreens I have tried previously either melted off with heat and sweat, or washed away in passing rain showers. Even with reapplication every few hours, these sunscreens (which work great on the beach) were just not cut out for what I refer to as “adventure days.” So after a particularly crispy day, I started to ask around to see if anyone had a good suggestion for a sunscreen. Finally I was led to Kiehl’s Cross Terrain UV Skin Protector SPF 50. I was originally a little skeptical of it’s wax-like texture, so I decided to put it to the ultimate test – a 2-week long backpacking expedition on the remote island of Moloka’i. After 12 days of full-on hiking, biking and swimming, I can confidently say that Kiehl’s has made a product that can withstand extreme elements! Though the wax-like consistency is intimidating for someone with sensitive skin like myself, the sunscreen offers long-lasting protection from sunburn without causing any breakouts. It is not too greasy, and has practically no scent at all. It also doesn’t melt like most other sunscreens do. This product comes in a convenient travel-size container, which is perfect when backpacking with limited space. 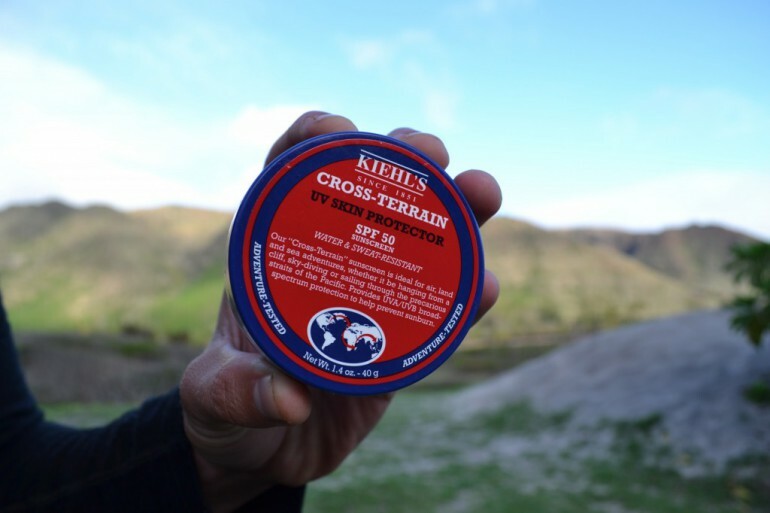 Though a little more on the expensive side at $25.50, Kiehl’s Cross Terrain UV Skin Protector is well worth the extra cost. For more information on Kiehl’s Cross Terrain UV Skin Protector SPF 50, or to purchase this great product, please visit Kiehl’s Since 1851.